Icahn is known for its progressive stance towards education. They have an early admission program for sophomores in college, called the FlexMed Program, which allows students to pursue their undergraduate studies without any required pre-med coursework or even taking the MCAT. Students accepted into FlexMed must maintain a gpa of 3.5 and complete their Bachelor’s degree, in addition to other requirements. “FlexMed is all about flexibility in your education and the opportunity to pursue what you love to learn. It allows talented students with lots of initiative to ‘flex’ their intellectual, creative, humanistic, and scientific muscles during college.”—David Muller, MD, FACP, Dean for Medical Education, Professor and Marietta and Charles C. Morchand Chair in Medical Education. Applicants to the Icahn School of Medicine at Mount Sinai are encouraged to highlight their achievements in many areas, including scholarship, advocacy, personal maturity, integrity, intellectual creativity, leadership, innovation and motivation for medicine. Students are encouraged to take pre-med coursework in statistics and biochemistry and it is “strongly suggested” that they demonstrate fluency in a second modern language, preferably Spanish or Mandarin. Icahn offers MD/PhD and MPH programs, but also has a strong focus on primary care. For the first two years of medical school at Icahn, students participate in the Longitudinal Clinical Experience, where they are introduced to the primary provider’s clinical reasoning and patient-centered approach. The campus is located on the border between the Upper East Side of Manhattan and East Harlem, a location which exposes students to disenfranchised patient populations with chronic health issues. Students are guaranteed housing in Aron Hall, located across the street from the school and close to Central Park. Location, flexibility, and patient population are often cited as reasons why students choose Icahn. This can be either a brief paragraph or a bullet point list. Focus on 4-5 main activities, and describe your role and the hours you spend on each activity per week. DO NOT be tempted to answer this question if you are a full-time student. Using this space inappropriately will at best, annoy the reader, and at worst, suggest that you don’t follow rules. This questions involves a little bit of soul searching. What mistakes have you made and what did you learn from them? While you might be tempted to turn this into a strength based question (ie, I am too much of a perfectionist), this avoids the main point of the question. They are looking for your self-awareness and ability to learn from mistakes. Try to think of a skill that you have worked on after being told you were not up to par. Show them that you have the ability to grow and change, and that you do not expect yourself (or others) to be perfect. This is a teamwork essay and a challenge essay all rolled into a mere 200 words. Applicants tend to misread this question and list a series of teams they were on, instead of going into depth on one challenge. To avoid this mistake, write down 2-3 situations when you worked with others to meet a common goal. These might include a group project for a class, a research team, a leadership role in an organization, a sports team, or volunteer work. Do not include teams that you only witnessed, such as shadowing a team of doctors (your passive role won’t showcase your teamwork). Next to each situation, think of a challenge that arose and describe the skills you needed to resolve it. Did you use empathy, problem solving, or flexibility? Now pick the situation that best shows a personal strength. Be careful not to take credit for everything. Teamwork is about playing in the sandbox with others, so show your awareness that it takes more than one person to build a great sandcastle. When you appreciate and recognize the strengths and contributions of others on your team, challenges are often easier to overcome. If there is an important aspect of your personal background or identity or a commitment to a particular community, not addressed elsewhere in the application, that you would like to share with the Committee, we invite you to do so here. Aspects might include, but are not limited to significant challenges in or circumstances associated with access to education, living with a disability, socioeconomic factors, immigration status, or identification with a culture, religion, race, ethnicity, sexual orientation or gender identity. Briefly explain how such factors have influenced your motivation for a career in medicine. Completing this section is optional. This question allows you to introduce the admissions readers to an important part of your life not discussed elsewhere. It can be about something in your personal background, identity, or a significant commitment that you made. Icahn is looking for at least an active role, if not a leadership one. While you have wide latitude in terms of topic, this question is guiding you to focus on how you overcame a significant challenge, and how that experience affected your decision to pursue medicine. It is important to put these two parts together, rather than simply talk about the hurdle you faced. You can also emphasize how you learned from your experience and will be a better physician as a result. Make sure your essay demonstrates a “cup half full” attitude to life’s challenges. Ask someone to go through your essay looking for signs of a negative slant, then work to give it a more positive interpretation. Please describe an influential experience that motivated your decision to become a physician-scientist. This could be a particularly rewarding moment in the lab, an encounter with a patient, or a challenge with a research problem. Use this question to show your motivation for both medicine and science. What do these two degrees offer together that you could not do with only one? What is the toughest feedback you ever received? How did you handle it and what did you learn from it? Please tell us about a time when an experiment didn’t go as planned or yielded an unexpected result. How did you approach this challenge and what did you learn? This question highlights your problem solving abilities and your ability to handle and grow from failure. Describe how you felt and what thoughts went through your mind. What was your plan of action? Limit your answer to one situation and show how you grew from it. What are your career goals? Which characteristics of the MD/PhD Program at the Icahn School of Medicine at Mount Sinai do you believe will help you to achieve them? This is a “fit” question. First, state your specific goal. Do you want to combine research with clinical practice, or design medical devices that improve safety in medicine? Then, state the reasons that Icahn will prepare you for this goal. You want to show that you are aware of Icahn’s unique programs and how they will help you meet your goals. 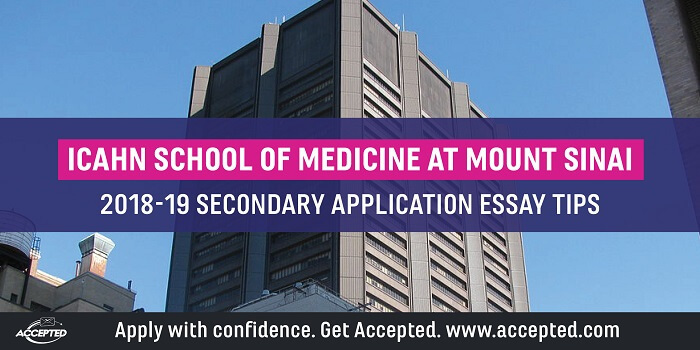 If you would like professional guidance with your Icahn School of Medicine at Mount Sinai application materials, check out Accepted’s Medical School Admissions Consulting and Editing Services, which include advising, editing, and interview coaching for Icahn School of Medicine’s application materials.